You probably heard the word mindfulness many times over the last years and maybe wondered what is it and what good does it do. Here is an attempt to demystify, clarify and simplify this abstract and blanket-used concept. 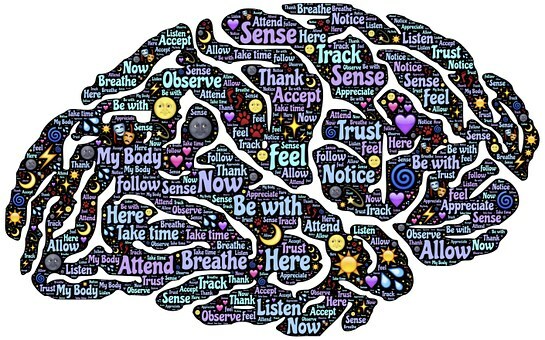 We equate our mind with our brain; our brain is a very complex structure and is in charge of creating, processing and maintaining endless thoughts, emotions, words, images, memories, insights and connections. Are we our mind? Is our mind more powerful than our life force? Who is in charge - we or our mind? Do we have a choice about where we put our attention and do we know what it is focussed on? Who is the focuser/attention-payer/observer/conscious one? Over time, I realized that my mind was becoming more and more powerful and that I was giving away my power to my thoughts and emotions, so my mind became my boss; many times, a harsh and malevolent one. The detriments were many; sleepless nights, constant worry, more damning thoughts, loss of joy, fatigue and possible physical manifestations such as ringing in the ears, headaches, immune and adrenal system struggles. “The mind is eternally confused”(Sadhguru). And I would add, confusing. We know that the overpowering mind is the culprit in most mental illnesses (anxiety and depression being the most obvious ones) and probably physical illnesses as well. It will be fair to say that this kind of mind is “mindless” as it lacks focus, direction and purpose. It goes everywhere, anytime, “madly in all directions”. Being mindful means paying attention right now, right here – the past is done as I do that and the future has not happened yet. I am in charge of where I take my own mind and I am fully conscious of choosing to be fully present to myself in the present. “I am more than my body, more than my mind. There is no moment but this moment. The way it is right now is the way it is; nothing else can happen in this moment.” (Inner Engineering– Sadhguru, isha.Sadhguru.org). The benefits of being in charge of our mind and directing it to be here and in the now are many (see John Kabat-Zinn, MD, for some robust research in this area) – anxiety and depression are greatly reduced or transformed more readily into contentment, acceptance and aliveness; we build resilience and equanimity in the face of challenges and adversity; some physical issues are resolved into better health. Confusion makes room for clarity and purpose; old rehashed thoughts and patterns make room for freshness and vibrancy, for the inner voice of intuition, creativity and pure knowledge. The good news is that the mind is highly trainable because of its plasticity (the ability to change and adapt and build new neural connections). What can we do to become more aware and present to ourselves? There are myriad things in our daily life we can do; for example, when I wash dishes, I can choose to let my mind take me wherever it wants to go OR choose to wash every dish as if I am doing it for the first time, with utmost care and love and focus on every detail of the dish, my hands, the soap etc. When I walk, I can stomp on the earth while living from my neck up OR I can take each step with reverence, feel each part of my foot as I do that and tread softly. “Kissing the ground with each step” (Thich Nhat Hahn – How to walk). It is helpful to have a regular practice, which serves as a guiding tool for being more present to our own life. I have my regular yoga and meditation practice that I do twice a day (it took 25 years to get to this place). On a day where my mind hijacks me and I try to balance in a yoga pose, faltering reminds me of my lack of focus and helps me bring myself back to being here. Or, while in meditation, the mind starts creating unconscious noise; as soon as I become aware of this (and it happens faster with regular practice), I can bring myself to focus back on my breath or on the mantra I am reciting or on my hands. I find it helpful also to recite “Not this thought; I forgive this thought; I surrender” (Sahaja yoga - www.freemeditation.ca). This is what meditation is – a way to help us come back from the mindless place by being awake, observing what happens without judgement, irritation or frustration. In the beginning, it feels futile as the mindless mind reasserts itself again and again. With time, diligence and willingness, we find blanks in the constant internal chatter. In these blanks there is stillness and peacefulness; nothing else is needed. This stillness gets easier to access as we persevere; even the days of struggle are reminders to be patient and compassionate with what is. It is helpful to start in a more structured way - with a teacher, a meditation or yoga group. I recommend trying out different settings, groups and teachers to start with. I find Sahaja yoga (www.freemeditation.ca) very accessible as well as Sadhguru’s Inner Engineering(isha.Sadhguru.org). I use both practices daily. Most mindfulness-based practices have certain commonalities. Focussing on the breath is probably the most accessible form of being in the here and now; as the mind takes over, we bring our attention back to the inhale/exhale flow. For many people, lighting a candle and keeping our attention on the flame feels easier to start with. As the focus becomes steady, we can close our eyes and “see” the flame in our mind’s eye. Sound is a powerful way of accessing the present – either by listening, chanting or verbalizing affirmations. It may be easier to start with vocalizing and later, as the attention drifts less, to whisper and eventually, with no external sound at all. Other forms involve daily expression of gratitude, asking for guidance and naming/acknowledging what is happening internally at the moment – in the body and mind, again, without judgment or criticism. It may be helpful to do this in writing to start with (the old way, with a pen on paper) or using our voice to ask ourselves how are we doing right now, and then just sit with what is and let things be. Body scan – lying down on our back with eyes closed, starting from the toes up, going over every part of the body, feeling it, acknowledging it or asking how it is doing and doing our best to relax it. I welcome your feedback on anything you have read so far and/or have tried.